There are a bunch of restaurants on Willy Street that have been on my “places to visit” list for a long time. It takes time for me to get to these restaurants because I live so far away and there’s a population of “regulars” that clog up those restaurants everyday. I don’t mind fighting for a table, that’s usually a sign of a good restaurant, but sometimes it feels weird being the only one in the restaurant that isn’t on a first name basis with the bartender. A couple weeks ago a friend and I were planning on grabbing an earlier dinner and I thought that would be a good time to try and grab a table at a Willy Street restaurant. 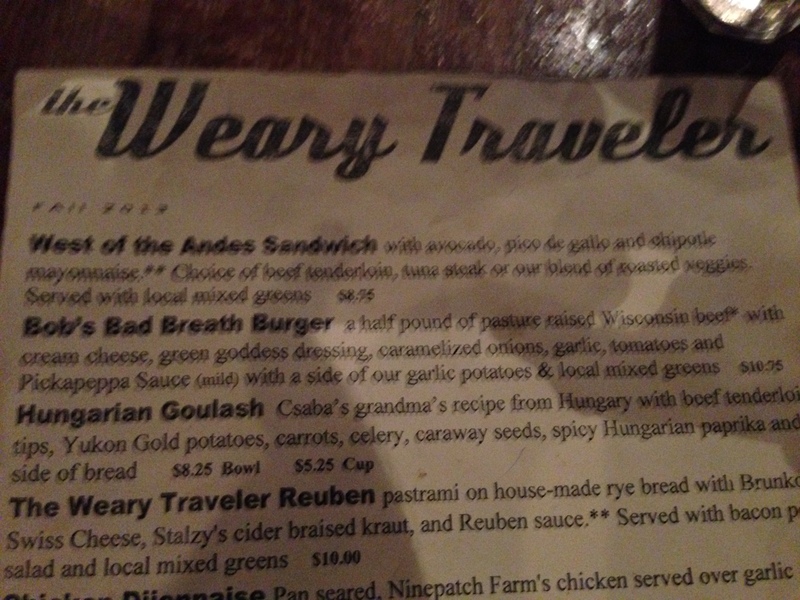 After considering all the options, my vegetarian friend and I decided to go to the Weary Traveler. They are known for their Bob’s Bad Breath Burger with garlic in every component, but they are also known for having a decent amount of vegetarian options. When we got there we had a hard time getting in to the actual building. The first two doors we tried were locked, and we stood outside slightly confused for a couple seconds before a “local” walking past told us the door was around the corner. Once we finally got inside, we had no idea what to do. It wasn’t clear if we were supposed to wait to be seated or grab a table, so I held our spot at the entrance and my friend went to investigate. While she was gone the bartender randomly yelled that I should take a small table in the middle of the room. From what I could tell, there were two dining rooms divided by a wall covered in eclectic stuff (I have to use that word for lack of a better one, there were pictures, books, globes, metal signs, musical instruments, etc. all over the walls). The bar runs the entire width of the building, and the entire restaurant was a bit too dark for me (I felt like it was almost at the point where I would have to use my cellphone light to read the menu). The dining room we were in was extremely cramped. Multiple times servers had to swing dishes over our heads to get them to their destinations, and when our waiter was talking to us he inevitably ended up in the way of another server. They also didn’t mention they had specials. We figured that out by looking around at all the stuff on the wall and realized that one of them was an actual specials board. My intent from the beginning was to get the Bob’s Bad Breath Burger for two reasons: 1. it’s what they are known for, and 2. I love garlic in any and every capacity. But for some reason that night I was not in the mood for a burger. So I asked about the Cioppino listed on the specials board. 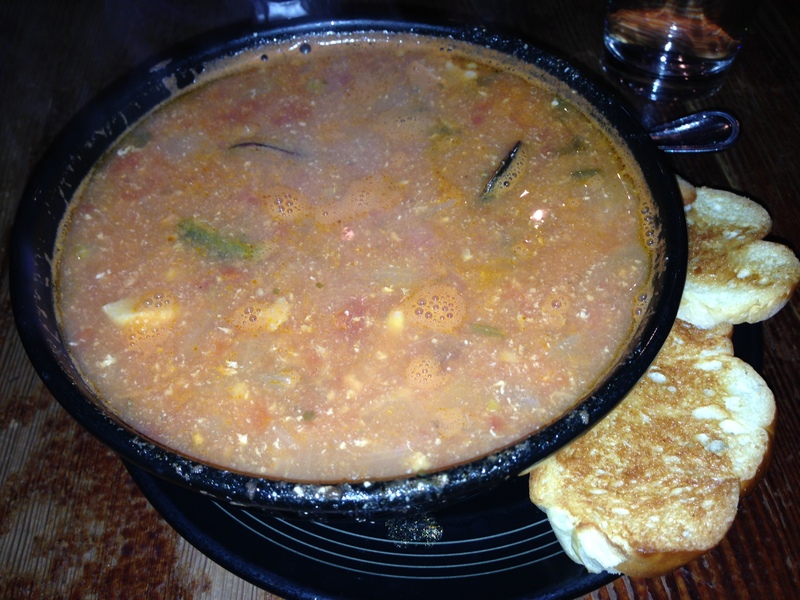 A Google search before the waiter came back told me a Cioppino is a seafood stew that can be cream or tomato based. Now seafood and cream sounds like an extremely disgusting combination to me so I was really hoping theirs was tomato based. The waiter told me it was indeed tomato based, came with mussels and salmon, and had a great flavor (he said he had the Cioppino instead of his normal choice for dinner). So I got the Cioppino with a heavy heart knowing that I had always wanted to try the Bad Breath Burger. But once the stew was set down in front of me I didn’t think about the burger anymore. It was steaming hot and a surprisingly large serving. The broth had a great earthy tomato and seafood flavor; something very hearty and homey. There were large, perfectly cooked chunks of salmon in it alongside corn, onions, and peppers. I was also very excited to find there were three mussels hanging out at the bottom of the bowl. 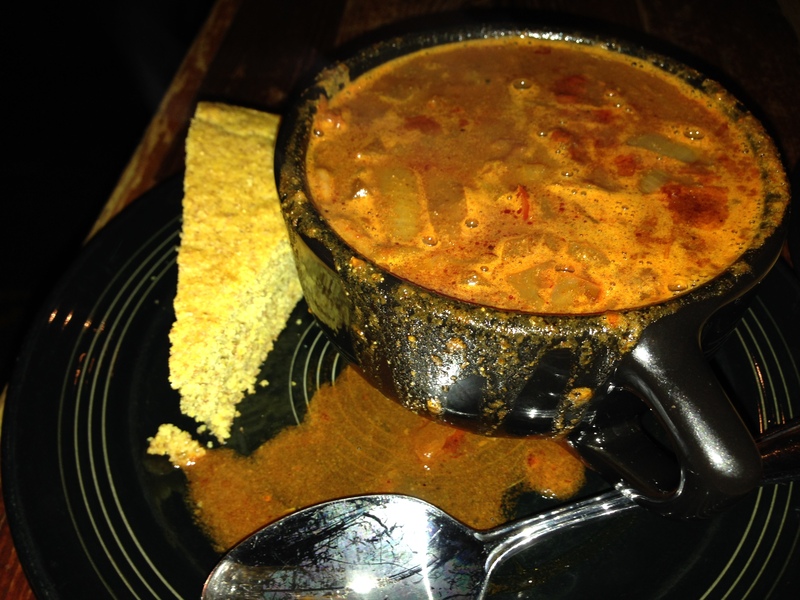 Fish stew is not an appealing description but this was one of the best specials at a hipster pub I have ever had. My friend couldn’t decide between two of the vegetarian options so she got a cup of the vegetarian chili and the grilled cheese. She enjoyed both, but my favorite of the two was the vegetarian chili. Vegetarian chili tends to be pretty flavorless (based on most of my experiences with veggie chili), but this one was pretty great. I’m not sure what was in it but the couple spoonfuls I had were great. 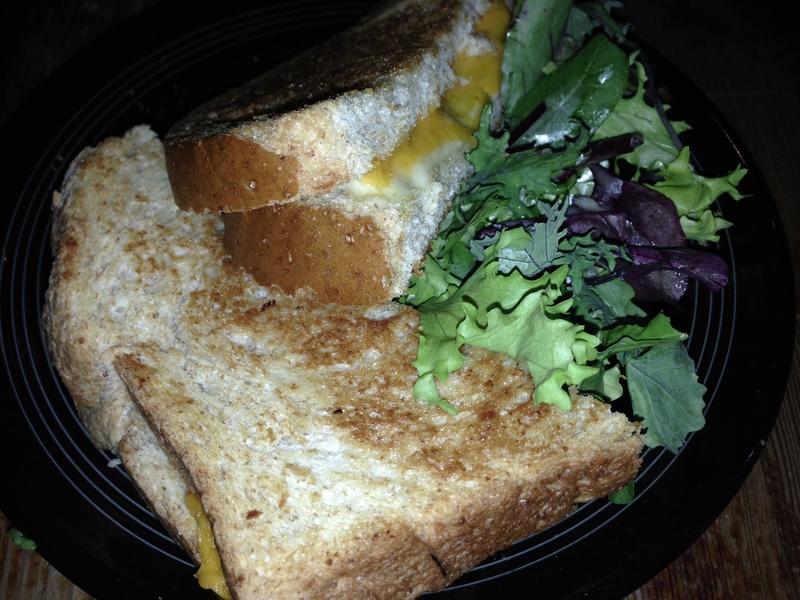 The grilled cheese had cheddar and mozzarella on it, which were perfectly melty and stringy. The sandwich was a bit too heavy for my liking though because the bread tasted like two thick pieces of garlic bread made into a sandwich. Some people might really like that heaviness, but it was too greasy and heavy for me. FOODNOTES: Don’t worry if you can’t figure out how to get in or how to get a table…they will even still serve you if they don’t know your name. To avoid the super hipster crowd try being there before 7pm. Make sure you look around for the specials board and consider what they have…mine turned out super well. The prices are on par with what you would expect for a hipster pub on Willy St. in Madison, but the food is a ton better than a generic pub. None of their desserts sounded worth it (they had ice cream and two random cakes listed), but I will definitely be back to try the Bad Breath Burger sometime!